1. If you don’t eat peanuts- replace with cashews instead. 2. If you don’t eat soy, replace tamari with coconut aminos. 3. If you don’t eat coconut sugar, try replacing it with a few drops of stevia (we haven’t tested this out, so not sure how it would turn out). Alternatively, if you don’t have a sweet tooth you could just omit the sweetener all together and add some extra lime juice. 4. 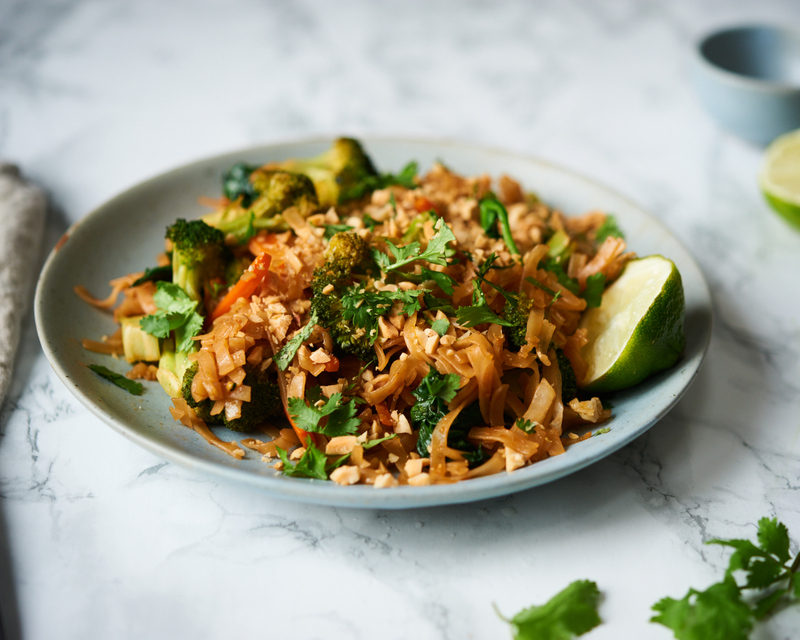 Don’t eat grains, replace the rice noodles with kelp noodles and you’ve got a really quick, easy meal! 1. Saute the garlic and ginger for 30 seconds in coconut oil in a large saute pan. 2. Add in the broccoli, carrots and nappa cabbage and saute for 5 to 10 minutes, until the veggies are lightly cooked. 3. Meanwhile, prepare the rice noodles according to the instructions on the box. 4. Remove veggies from the pan and set aside. 5. If you are making egg, tofu, or chicken, saute them at this point with some coconut oil in the pan. For eggs- scramble together and cook quickly until fluffy. Tofu or chicken can be seared on the outsides (cooked through to center). Skip this step if you’re just making vegetables. 6. Whisk together the ingredients for the sauce, except for the miso. 7. Add the sauce into the pan and saute with the cooked rice noodles for a few minutes, so that they absorb all of the liquid and are very flavourful. 8. Then you can add the cooked veggies (and protein option if you prepared it) back into the pan, tossing together with the noodles. Mix in the miso at this point. Try not to heat the miso too much as the heat destroys the healthy bacteria found in miso. 9. Divide into 4 servings and top with fresh cilantro, chopped peanuts, and lime wedges.